Rubicon spent Â£10,000 porting iOS hit, Great Big War Game to Windows RT. Thus far, it's made a whopping Â£52. Microsoft is pushing Windows RT, the mobile version of Windows 8, as a competitor to Apple's all-powerful iOS, right down to the similar app stores. But, according to Rubicon Development's Paul Johnson, Microsoft is doing a cack handed job of promoting games on the service. 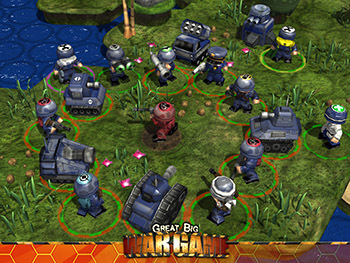 At one point, Great Big War Game was the number one strategy game on iOS, but it's completely failed to gain any traction on Microsoft's platform, despite being one of only a handful of semi-decent games available on the service. Johnson estimates that it cost Rubicon some Â£10,000 to port the game. It managed to earn Â£52 in its first week on sale. "That's not a typo," writes Johnson. "And despite this, and the fact that GBWG is one of only several halfway decent launch titles, Microsoft have confirmed they will not give us any promotional features or help us with visibility in any way." Of course, Windows RT doesn't enjoy the same gargantuan user base that the app store boasts, which would explain somewhat lower sales. But according to Johnson, the Windows RT version of the game is failing hard, even in comparison to the Android and RIM (Blackberry) versions. "Apple regularly promote our apps," he continues. "Android regularly promote our apps. Even RIM (Blackberry) regularly promote our apps. We enjoy working with those companies and it's nice to see them acknowledge that we bring them some small amount of additional value to their setup. Firms our size need a bit of a leg up, and we go out of our way to show our gratitude to the above for helping us out in this way from time to time." This isn't the first time Microsoft has been accused of failing to promote the indie outfits that could earn the company money. Developers working on indie games for XBLA have often complained about their games being dumped behind multiple menus and receiving little to no promotion. Even big hitters like Team Meat (Super Meat Boy) have complained about the poor promotion. "Microsoft on the other hand clearly do not value us at all," Johnson adds. "Even whilst there's almost nothing to promote, they will not feature our title for bizarre admin reasons. And this is whilst their store is empty and they need developers like us to fill their store far more than developers like us need them to pay us Â£50 a week." "If anyone already read this post, it has had a very positive effect and Microsoft have graciously decided work with us to iron out the problems and get us past this incident. With a sense of fair play, I'm putting my grumpiness on hiatus and deleting the juicy bits. Which was all of it, sorry."